Glass is an unusual sequel to a pair of movies made 16 years apart which are, at best, only loosely connected by a single scene. The film unites the main character from 2016's Split with the primary characters from 2000's Unbreakable, throwing the unlikely trio together to be examined by a psychiatrist (Sarah Paulson) specializing in a growing mental disorder of people believing themselves to be super-heroes. If you've seen either of the previous two M. Night Shyamalan films you know that David Dunn (Bruce Willis) and Kevin Wendell Crumb (James McAvoy) are indeed super-human while Elijah "Mr. Glass" Price (Samuel L. Jackson) fits the bill of the genius super-villain to stir the drink of this unusual cocktail. Knowing Dr. Staple's (Paulson) premise is faulty makes it hard to legitimize her point of view, but it does create tension waiting for the truth to be revealed. While messy in spots, and rather slow to get started, Glass is never boring. As expected, the film features a few Shyamalan twists as it delivers a suitable sequel to Split, even if it doesn't reach anywhere near the heights of Unbreakable. 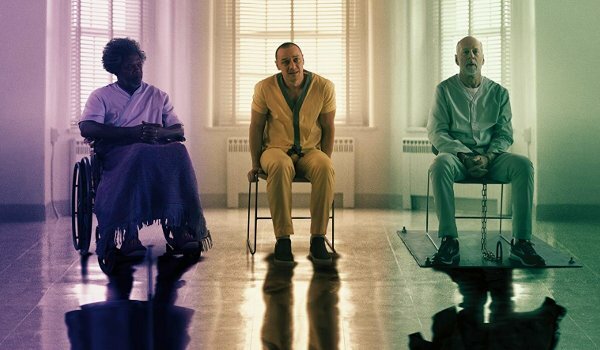 Because the plot gets a bit sloppy at times, and so much of Shyamalan's twists are telegraphed, I don't know how well Glass will work on multiple viewings (although I think there's nearly an identical chance I may enjoy it more a second time), but its mere existence is bizarre enough to create legitimate interest. Along with Willis and Jackson, Spencer Treat Clark also returns as David Dunn's son Joseph who is forced to question the legitimacy of his father's heroics after helping and spurring him on for more than a decade. Anya Taylor-Joy also returns to reprise her role from Split as the victim who escaped Kevin's clutches. Along with Elijah's mother (Charlayne Woodard), these characters offer a different perspective to the events happening inside the mental institution and prove to each have important roles in how the film ends. 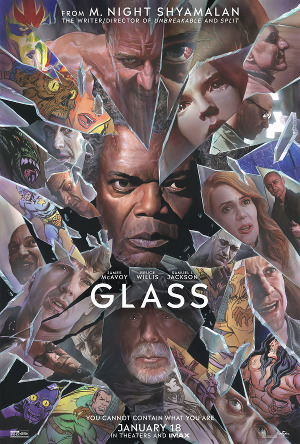 Glass is unquestionably a flawed film. It's a far cry off from a return to the form of Shyamalan's first couple of movies. That said, there's something here that proves interesting to see unfold. Whether or not fans will forgive Shyamalan for some of the script's choices will have to be seen, but the writer/director returning to examine what makes a hero (or villain) tick and what his role might be in today's society offers more than the usual comic-sized beat down and certainly a more original take on the super-hero genre than we're likely to see any time soon from either Marvel or DC.